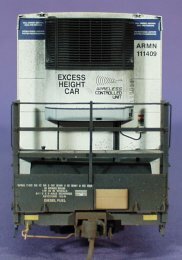 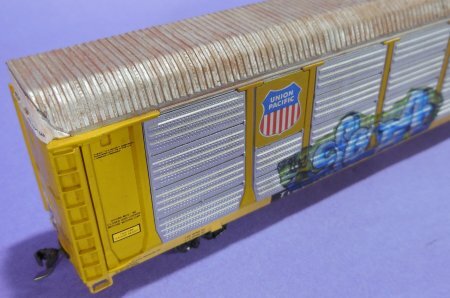 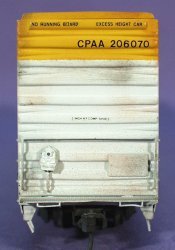 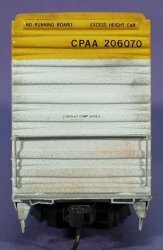 On this page, I am going to present some of my special freight cars for my layout (not for sale). 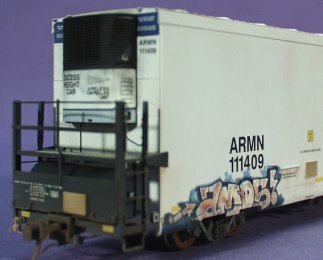 Auf dieser Seite präsentiere ich ein paar spezielle Güterwagen für meine Anlage (unverkäuflich). 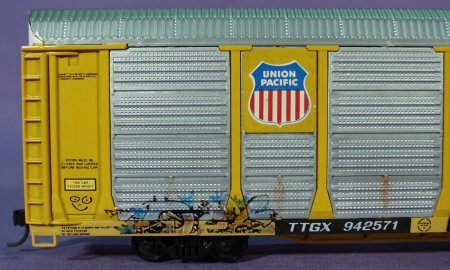 During my June 2011 Cajon Pass visit, I was able to catch this ARMN 64' Reefer in an Union Pacific NB train passing Hill 582 on the Colton-Palmdale cutoff. 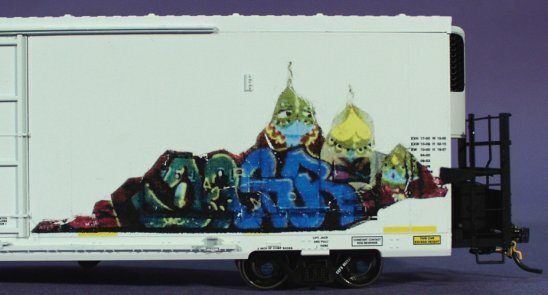 I was really impressed with this huge graffiti of a monkey drinking water. 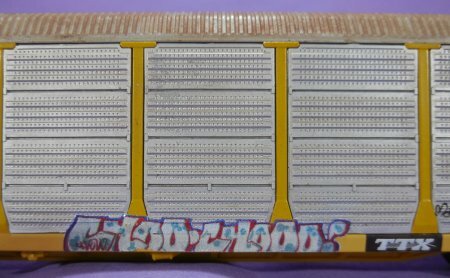 The picture of the monkey lost color while copied down on the blank decal sheet. 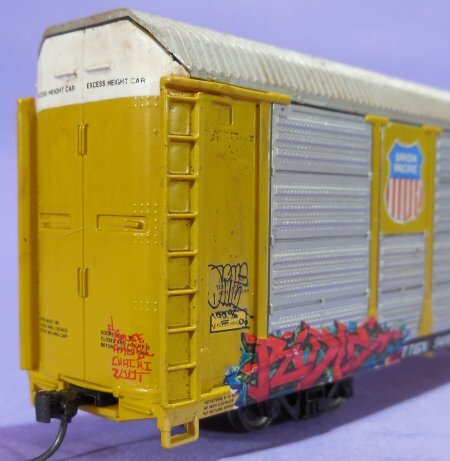 On the rear side are graffiti decals made by Blair Lines. 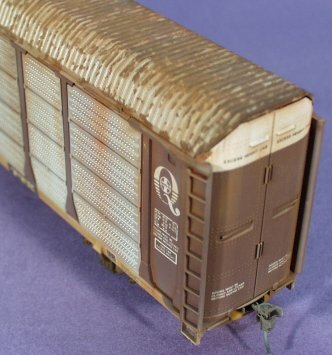 This is a brass model of an 86' Hi-Cube Box Car for CP Rail. 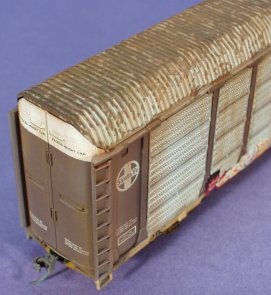 Thanks to Albert Mader for painting and weathering this model. 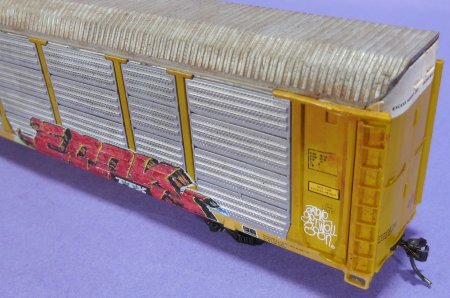 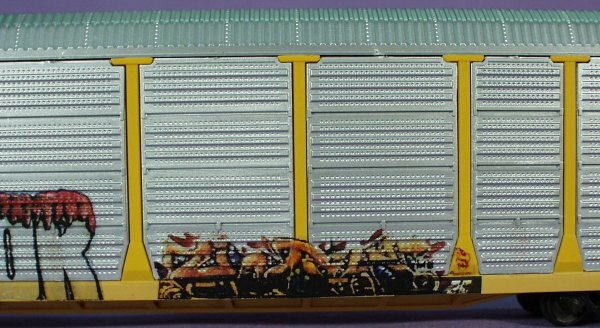 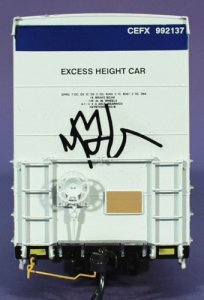 Special thanks to Peter Schönenberger for this unique box car and the custom made monkey graffiti. 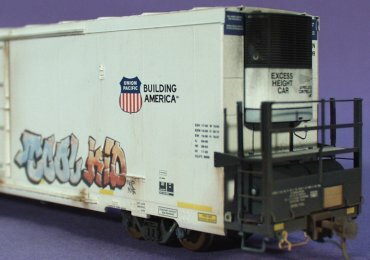 Thanks to Kim Nipkow, who placed the other 3 graffiti decals from Blair Line. 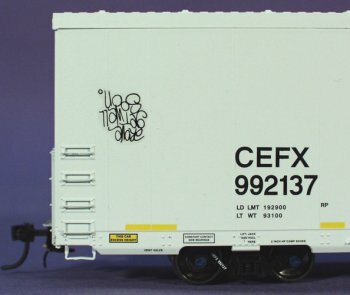 Photo of this CSX Bi-Level Auto Rack was taken on 3/13 in Duplainville, WI by Tom Stebly (copyright). 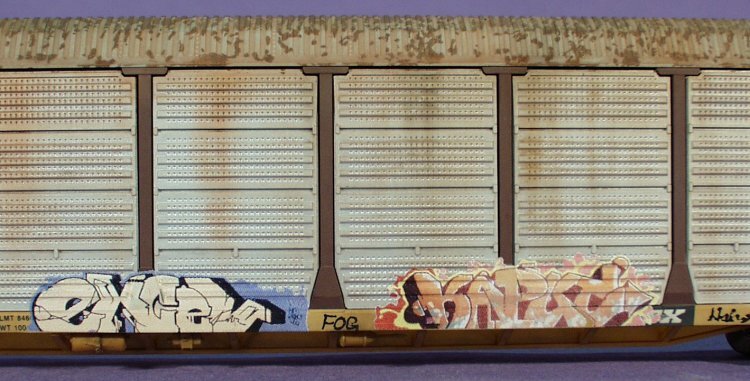 Photo of this CSX Tri-Level Auto Rack was taken on 9/13 in McWillie, OK by Tom Stebly (copyright). 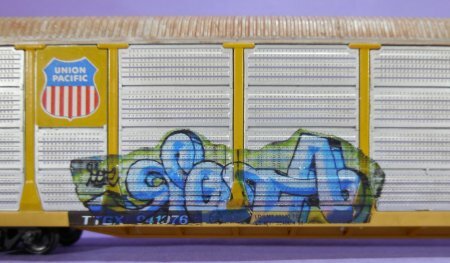 Photo of this car was taken in Revelstoke, BC (Canada) by Markus Senn in 2013. 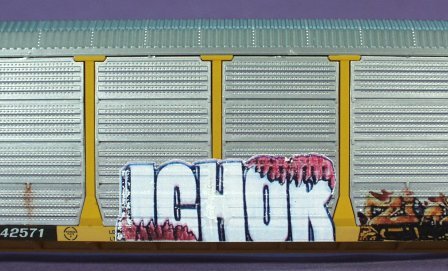 This special (custom made) graffiti looks great on this model. 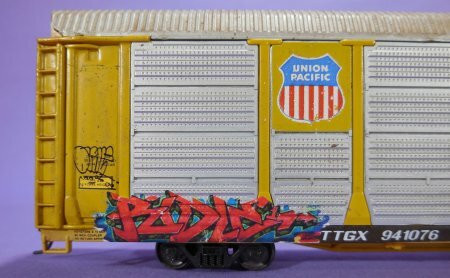 On the rear side is another graffiti decal. 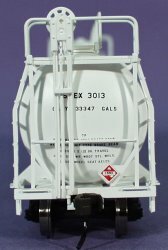 This is an Atlas Tank Car. 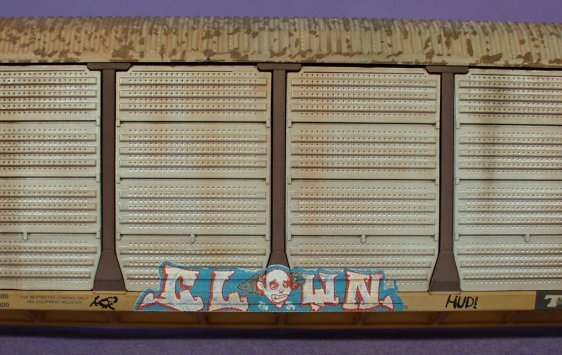 Thanks to Markus Senn for the original photo. 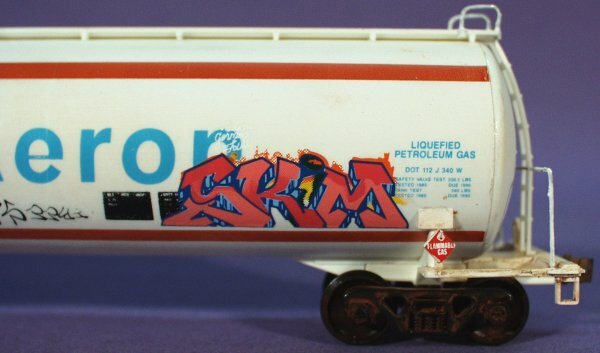 Special thanks to Peter Schönenberger for creating this "one of a kind" graffiti on this tank car. 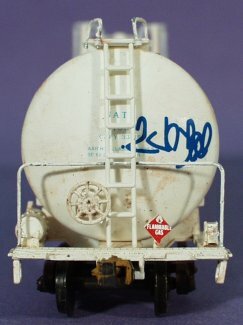 Here is another tank car with a special graffiti made by Peter Schönenberger. 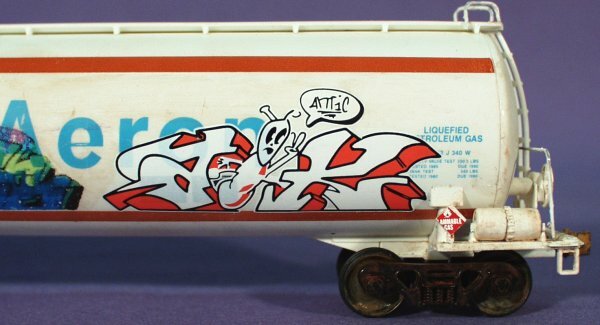 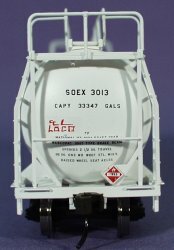 this huge graffiti has been seen on a real tank car and was copied and transferred on a decal sheet. 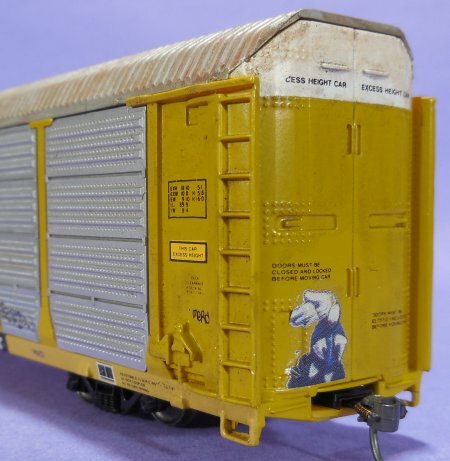 No question, this Auto Carrier looks very realistic and Kim did a great job.